It won't win any awards for the most beautiful burger but VJs Special—a hamburger topped with chili, onions, dill pickle spears and oodles of mayo—is one of Winnipeg's finest burger-shack burgers. Ask Winnipeggers who makes the best burgers in town and you're likely to get a long list of favourites. Whatever the length, VJs almost always makes the list. The postage-stamp sized burger shack on Main Street just a few blocks north of Broadway, is a city institution. It's open every day, all-year long except Christmas Day. Rain, sleet, shine or hail, burgers are on the grill and there's usually a line-up out the door. When it comes to burger stands, VJs is as close to authentic as it comes. Inside a small vestibule, there's a walk-up window at the kitchen. Customers place orders, take them to go or pull up a seat on one of several patio tables and benches sitting on VJs adjacent lot. Others jump back into their vehicles and eat as they sit behind the wheel. VJs attracts an eclectic clientele including the city's young professionals in suits and skirt sets, young families, construction and trades folk, and tourists. It doesn't have a splashy neon sign or the slick decor of today's modern burger bars but it has its own nostalgic charm, including a Pepsi Cola sponsored menu board emblazoned with the infamous red logo. While today's burgers have been given a makeover with mash-up ingredients, theme toppings and haute cheeses, VJs keeps it grounded. Lettuce, tomato, mustard and onions are as fancy as it gets. And that works just fine. 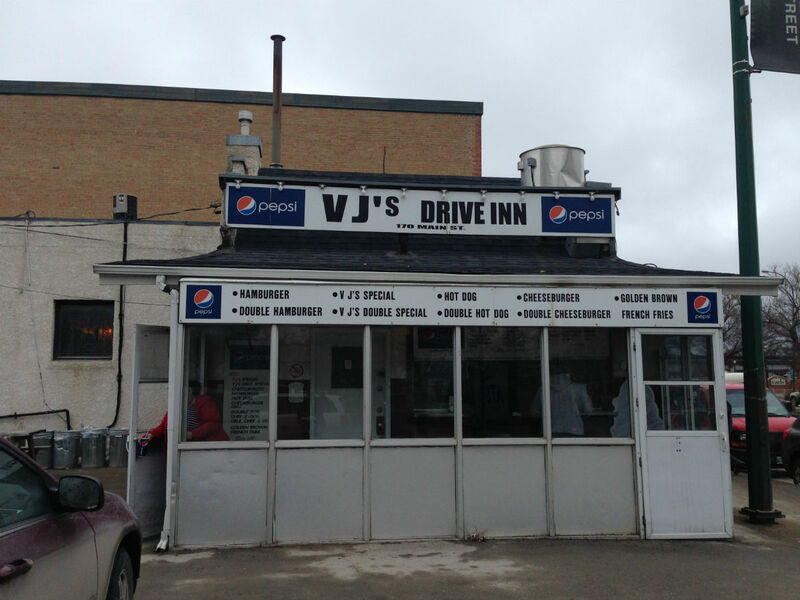 VJs Drive-Inn makes a fantastic burger. VJs Special is a juicy and sloppy must try. You will devour this stacked monster in minutes, licking every last drip from your fingers. This chili topped burger—VJs version of the fat boy—is dressed with shredded lettuce, diced onions, sliced tomato, yellow mustard, dill-pickle spears and oodles of mayo on a white bun. The cumin-and-chili-powder laced chili adds an extra dimension to take this burger over the top. This is also elbows-deep eating. Your fingers and hands will get messy and there's an 85 per cent or better shot your shirt won't come out unscathed. Drips and drops happen. In three bites or less, your burger won't look pretty as the chili, patty and all the extras get mashed between the bun. It ain't fancy but it sure is delicious. And that's what it comes down to. Because in our modern world of high-falooting cuisine, exotic ingredients and gastronomical engineering there's something so comforting about an unpretentious burger served from a meat-and-potatoes burger shack. Follow Peg City Grub on Twitter @PegCityGrub. E-mail questions or comments to goodeats@pegcitygrub.com.